Welcome to G&A Roofing and Chimney Croydon, expert roofers and chimney repairs. For professional chimney repairs and re-builds, storm damage and emergency repairs, contact our Croydon team of roofers about your roof repairs today on 020 7205 5785. G&A Croydon is a local roofer with a reputation for quality. We offer a vast range of services to take care of your home or business in Croydon, including chimney re-building, lead flashings replacement, emergency work brickwork re-pointing, chimney pot fitting and chimney removal. If you have a leaking chimney in Croydon, or damage due to the recent storms, contact a roofer today to discuss your requirements. We are experts in chimney repair work and our Croydon roofers will be more than happy to help. Don’t delay fixing a leaking roof or chimneys, it could lead to serious problems later down the line.Our Croydon roofers also offer general repairs, plastering, timber work and home maintenance work too. Our roofers can provide services such as emergency roof repairs, guttering repairs and replacement and much more. G&A was established over 26 years ago, and in 2005 G&A went limited. We are known for providing a professional roofing and chimney rebuilding service in Croydon. We never skimp on quality and our team of roofers and chimney experts are committed to providing excellent workmanship and care. 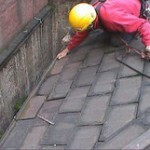 Each roofer is fully trained and will undertake a risk assessment before starting any emergency work on your property. Call G&A Roofing and Building Croydon for advice from a trained roofer today. Contact our friendly team for help on 020 7205 5785. This entry was posted in Chimney Repairs and tagged chimney, Croydon, emergency, repairs. Bookmark the permalink.